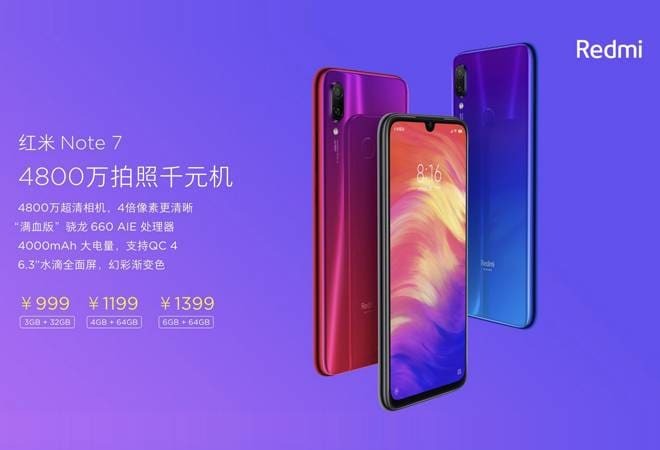 Xiaomi Redmi Note 7 has been launched officially in China. The phone sports a teardrop notch, dual rear camera setup with a 48-megapixel primary sensor the first smartphone. The successor to Xiaomi's popular Redmi Note 6 series, Redmi Note 7 is the first smartphone to be launched under the new 'Redmi by Xiaomi' sub-brand. As far as the hardware is concerned, the Redmi Note 7 comes with a the dual-SIM (Nano) slots and is seen to sport a 6.3-inch full-HD+ (1080x2340 pixels) LTPS display with 19.5:9 aspect ratio. The phone is driven by the 2.2GHz Snapdragon 660 octa-core SoC paired with Adreno 512 graphics, and 3GB, 4GB, and 6GB RAM options. Internal storage is at 32GB and 64GB options with the option to expand further using a microSD card slot. It measures at 159.21x75.21x8.1mm, and weighs 186 grams. The price of Redmi Note 7 starts at CNY 999 or approximately Rs 10,300 for the 3GB RAM + 32GB storage option. For the 4GB RAM + 64GB storage option the phone is priced at CNY 1,199 or Rs 12,400 approximately. There is a 6GB RAM + 64GB storage option priced at and CNY 1,399 or Rs 14,500. Coming to the phones optics, the biggest USP of Xiaomi Redmi Note 7 is its dual camera setup with one 48-megapixel sensor with f/1.8 aperture and another 5-megpapixel sensor. On the front, there is a 13-megapixel selfie camera with several AI features like face unlock, smart beauty etc. Coming to the connectivity, the Redmi Note 7 include USB Type-C port, 3.5mm audio jack, 4G VoLTE, GPS, AGPS, GLONASS, Bluetooth v5, and Wi-Fi 802.11a/b/g/n/ac. Redmi Note 7 also gets a 4,000mAh battery with Quick Charge 4 support. The new Redmi phone had earlier scored 1,462 in single-core test, and 4,556 in multi-core test on Geekbench listing.